It is upon us! Buckle your seatbelts and give the team advisor a Maalox — it’s time to assault the course and go for the gold! Registration began today for teams participating in the 18th annual NASA Great Moonbuggy Race. We’ll hold our opening ceremonies tonight at the U.S. Space & Rocket Center in Huntsville, Ala.
they’re both seniors, headed to the University of Alabama in Birmingham this fall. We’ll welcome old friends and new, go over the guidelines and walk the winding, half-mile race course (which, as you read this, is getting the finishing touches today from the Space & Rocket Center’s elite crew of groundskeepers and “moon mechanics,” under the watchful eye of head axle-breaker Dennis Gallagher… who occasionally breaks into villainous MWAHAHA laughter, we kid you not). And tomorrow, April 1, at 7 a.m. Central time, the buggies start to roll. So let’s wrap up our look at moonbuggy hardware with a few final elements — some critical, some cosmetic, but every one of value to your performance. And possibly your posterior. 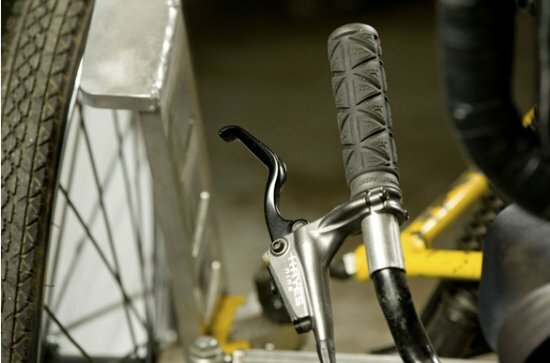 Steering configurations are as varied among moonbuggies as any other element, but the relative simplicity of the hardware — upright or drop handlebars (or a simpler straight handle or riser bar, like that on a mountain bike) which turn the fork and front wheels via a stem rotating in the headset — may mislead teams into giving it too little thought. The design is paramount here. How are you configuring your riders — side by side or one in front and one in back? Will they share steering duties, or does just one of them take on the responsibility of guiding the vehicle? Do the style and position of your handlebars match the seating angle of your riders? If they’re seated low at a backward angle for better pushing power, for example, you don’t want upright handlebars that force them to awkwardly lean up or forward to maintain control. 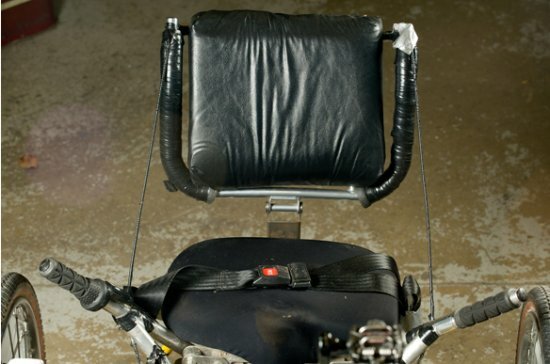 Look at a recumbent bike, with under-seat or over-seat steering. You may want to riff on that idea, and design a buggy with steering arms or joysticks positioned at the sides, permitting the riders the most aerodynamic profile and ergonomically satisfying ride positions possible. But testing must be rigorous. Does the system have the necessary responsiveness? How much power will it take to rake that speeding buggy around a sharp turn? Can “lowrider steering” measure up? Race organizer Gallagher, a NASA astrophysicist who works at the Marshall Space Flight Center, is always quick to point to mountain bikes as a good jumping-off point for basic buggy design, and this is another area where they can give you some good ideas. Especially consider the wider widths of mountain bike handlebars or risers, he says — which can dramatically improve handling. Dennis’s fellow engineer and race planner Tom Hancock, chair of the American Institute of Aeronautics and AstronauticsAlabama/Mississippi section, agrees steering is important… but he’s more concerned about brakes. He’s one of the guys who’s out there the night before the race, laying down something like 175 bales of hay — to make sure careening buggies have something soft to run into when they get out of control. down in a safe zone. Especially during that hairpin left turn right after Obstacle 3. Hancock says brakes come in all flavors among buggies — from the crude rim brakes found on regular bicycles; to internal hub or disc brakes for sturdier off-road or tandem bikes; to direct-pull or linear-pull brakes like the “V-brakes” found on many BMX and mountain bikes. With rim brakes, friction pads are compressed against the wheel rims themselves. Among internal hub brakes, they’re contained within the hub of the wheel. Your best options, our experts agree, are disc brakes, which have a separate rotor for braking, or linear-pull brakes, which seem to have the most hardware flexibility, work well with suspension systems based on more rugged off-road bikes, and stand up best to hard, abrupt braking. Whatever your configuration, Hancock says, whether they’re hand-operated or controlled by foot-pedals, the brakes are absolutely critical, and should be thoroughly tested repeatedly before race day. Riders can offset those dangers — pick a solid braking systems and train your drivers to apply them properly. Let’s move on to one of the most memorable elements of the moonbuggy — or it will be, after your riders disembark at the end of the course and discuss with you why you chose to skimp on seating. “Bucket seats are the best,” Hancock says. “Find something of quality that conforms, if possible, to the lower back and rear end. You want your drivers seated solidly to provide lots of lower-back pushing power. Simple folding seats can snap, Hancock warns — all the riders’ mass and energy is being centered in the lower back, and flimsy chairs won’t hold up. Likewise, saddles — simple bicycle-style seating — won’t suffice, because there’s no lower-back pushing power there at all. “That’s just asking for pain,” he says. He also advises against angled seatbacks. He’s seen teams cant the back rests 15-20 degrees — maybe in an effort to be more aerodynamic. “But depending on the configuration of the buggy, now you’re expending a lot of energy just to stay up straight to pedal,” he says. Whatever your seat of choice, Gallagher reminds all racers to include strong, buckling seat belts. No Velcro, no rope, no duct tape. “Seat belts are NOT part of the façade,” he says. The façade is where we’ll round out this exploration of the moonbuggy’s inner workings. This race is a historic legacy, after all, celebrating the Apollo-era Lunar Roving Vehicles that rolled across the surface of the moon in 1971 and 1972. It’s been 40 years since those fabled moonbuggies raised the bar for off-road racing, and your buggy needs a few accessories that put the finishing touches on this homage to NASA ingenuity and can-do spirit. 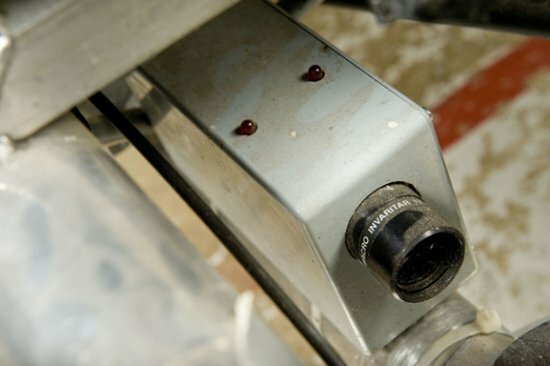 According to the race guidelines, each buggy must have a simulated TV camera approximately 2 inches by 3 inches by 6 inches or so; a simulated high-gain antenna with a reflector approximately 2 feet in diameter; two simulated batteries (roughly 4 inches by 6 inches by 8 inches); “moon dust abatement” devices, better known as wheel covers (or sweet, sweet fenders); a simulated electronic-controls radio and display console (totaling an approximate 1 cubic foot in size); and a national or school flag. Items get checked before and after each run… and you want to have the same set of goodies at the end that you had at the start. He suggests that new racers in particular keep everything simple to start. Try to keep accessories out of the way of the riders, so they don’t inadvertently knock them loose. “Small, secure and out of the way,” he advises, then chuckles. “One of the most novel approaches I ever saw was a team that just had a sign on the side of the steering column. It said, ‘Our whole instrument system is on the side of the steering column.’ ” Not exactly kosher — but it kept the teams’ focus on the bigger challenges. Don’t be afraid to get creative, though. “Some accessories are really great,” Hancock says. “We’ve had kids make working displays. A lot of them will bring a video camera and mount it on the front end to tape their run.” To get a look at what’s possible, check out the buggy from last year’s winning high school team, the International Space Education Institute. Their GPS tracking and other on-buggy hardware is mind-blowing! And visitors can get an actual buggy-cam experience — shot by high school racers in 2009 — inside the U.S. Space & Rocket Center at the NASA Education Competition exhibit. Just look for the mini-moonbuggies. Drivers — to the starting line! As the race draws ever nearer, Gallagher and Hancock reflect on what it offers — practical, real world engineering challenges that may open new career doors for many of our intrepid racers. Expect that inventive flame to deliver no end of unique, unexpected moonbuggy designs and configurations when we take the course on April 1. We may see three-wheelers. TWO-wheelers. Anything is possible. One team years ago designed something that looked like an exercise machine — both drivers were standing up. “Worked great til they hit the first obstacle,” Gallagher laughs. Be safe out there, teams. You’re invited to watch live race coverage all day Friday, April 1, via UStream at http://www.ustream.tv/channel/nasa-msfc. The race is expected to start at 7 a.m. Central time. Our deepest thanks to Dennis Gallagher and Tom Hancock for their help in developing this blog series. For those interested in learning more about these good folks who help us execute the NASA Great Moonbuggy Race year after year, you can read more about them here. My daughter is riding on one of the Purdue Calumet moonbuggy teams! Can’t wait to find a video of them! Go Purdue! the weight of the mango was mg (action)> capturing capacity (reaction)of the stem. i.e. the action and reaction during falling the mango are not equal. That proves incorrect of newton’s third law of motion. I try to understand on the other way. I hang a rope & strap 2kg weight with it , it is hanging; then hang 4kg , it is hanging. But it is fall down just when I hanging a 5kg weight in it. When there was hanging 2kg or 4kg weight, the capturing capacity of the rope was same or more than 4kg, but less than 5kg. So it is falls when 5kg is hanged. The weight (action)≤ the capturing capacity (reaction) of the rope. The weight (action)> the capturing capacity (reaction) of the rope. According to Newton’s third law of motion action and reaction are equal. Here IqI=IpI=>ImfeI=ImfbI=>Ife/fbI=M/m=>IfeI>IfbI. As engine and body are connect with each other , so it never possible IfeI>IfbI. That means action and reaction are not equal. When the wheel of goods carrying lorry gets into the mud , the wheel is moving when the lorry use force. The wheel use force on the mud but the ability of protesting of mud comparatively low. So the mud can not protest the wheel equally. Then the mud begins to move instead of moving the wheel and so the wheel slips. In this matter the action and reaction are not equal also. That is , it can be said that the quantity of reaction is not related to action and they are not always equal. Do the action and reaction act opposite direction? According to Vector’s law , Resultant of two equal and opposite directed force is always zero. That is meant that if action and reaction are equal opposite directed then any work is not possible. whatever the direction of the action is , object always prevents at right angles to that plane of applied point . It can not be said in every field that the action and reaction acts on opposite direction. After the analysis it can be said that action and reaction are neither equal nor acts from opposite direction . force is always used against the stability of object, if the quantity of the used force is more than the stability then with the rest force the work is performed. object always prevents at right angles to that plane of applied point and tries to change it’s direction. The Stability is the force which prevent or try to prevent the change in the shape , volume or position of the object occurred by external force. i.e. as the acceleration of bullet is great, the bullet moves very fast. A man is pushing a wall with force p. the stability of the wall is F , if the quantity of prevention of the wall is R ; When P= R ≤ F then the wall changes the direction by preventing the used force. So the wall does not break. When P>R=F then the quantity of the used force is more than the stability of the wall, and so the wall can not prevent the used force. As a result the wall remains broken. Am I wright ? Other recent MS patients who have had Autologous Stem Cell Transplantation (ASCT), or stem cell therapy have posted videos and comments on YouTube. http://www.youtube.com/watch?v=jFQr2eqm3Cg. Calgary MS patient Maralyn Clarke died recently after being treated for CCSVI at Synergy Health Concepts of Newport Beach, California on an outpatient basis. Synergy Health Concepts discharges patients as a rule without in-clinic provisions for follow up and aftercare. Post-procedure, Mrs. Clarke was discharged, checked into a hotel, and suffered a massive bleed in the brain only hours after the procedure. Dr. Joseph Hewett of Synergy Health recently made a cross-Canada tour promoting his clinic for safe, effective treatment of CCSVI for MS patients at public forums in major Canadian cities including Calgary. Joanne Warkentin of Morden Manitoba, an MS patient who recently had both the liberation therapy and stem cell therapy at CCSVI Clinic agrees with Dr. Gupte. “Discharging patients on the same day as the procedure is ridiculous. I was in the hospital being monitored for 12 days before we flew back. People looking for a place to have the therapy must do their homework to find better options. We found CCSVI Clinic and there’s no place on earth that’s better to go for Liberation Therapy at the moment. I have given my complete medical file from CCSVI Clinic over to my Canadian physician for review.” For more information Log on to http://ccsviclinic.ca/?p=866 OR Call on Toll Free: 888-419-6855. One of these photos showing heart beat controller, I mean it looks like break system…, well how does it work?…ha ha ha ….. And if I ask that how was your experience? If you participated in it that would be more exciting for me and for other as well. I really liked the last year Moonbuggy Race. Would there be a race this year? aStem cells are “non-specialized” cells that have the potential to form into other types of specific cells, such as blood, muscles or nerves. They are unlike “differentiated” cells which have already become whatever organ or structure they are in the body. Stem cells are present throughout our body, but more abundant in a fetus. This is fantastic! Happened upon the article looking for other information, now my space crazy 9 year old daughter and I are hooked! Looking for the video online, and she just asked her dad if they can try to build one together this summer, I’ll set up a page on my to follow their progress 🙂 Thanks for the inspiration! I saw a video of this event taken by my cousin who joined the race. It was awesome! All the moonbuggies looked so cool! After his relapse, David and his family were frustrated but undaunted. They had seen what opening the jugular veins could do to improve him. Because the veins had closed so quickly after his liberation procedure, they considered another clinic that advocated stent implants to keep the veins open, but upon doing their due diligence, they decided it was just too risky. They kept on searching the many CCSVI information sites that were cropping up on the Internet for something that offered more hope. Finding a suitable treatment, especially where there was no known cure for the disease was also a race against time. David was still suffering new attacks and was definitely deteriorating. Then David’s mother Janice began reading some patient blogs about a Clinic that was offering both the liberation therapy and adult autologous stem cell injections in a series of procedures during a hospital stay. “These patients were reporting a ‘full recovery’ of their neurodegenerative deficits” says Janice, “I hadn’t seen anything like that anywhere else”. She contacted CCSVI Clinic in late 2011 and after a succession of calls with the researchers and surgeons they decided in favor of the combination therapies. “I went to CCSVI Clinic in India without knowing what to expect” says David, “but I basically had one shot left and this was it. I was becoming pretty disabled, and I couldn’t think very clearly”. David was triaged with a clinic intake of other MS patients and had the liberation therapy on March 27, 2012. They also drew bone marrow from his hip bone in the same procedure. When he woke up from the procedure, he again felt the immediate effect of the widening of the veins. “In case anyone doesn’t believe that the liberation therapy works, I can tell them that this is much more than placebo effect.” The MS symptoms described earlier again disappeared. Four days later he had the first of the stem cell injections from the cultured cells taken from his hip bone during the liberation therapy. The first transplant was injected into the area just below his spine. Over the next 4 days he would receive about 100 million stem cells cultured in specific growth factors for differentiated effect. Dr. Av Gupte, the neurosurgeon who has now done over 2000 adult autologous stem cell transplants for various neurologic disease conditions says that the stem cells in David’s body will continue to work their healing process for the next year. “With the incredible progress I’ve seen so far, I won’t need a year”, says David. “It’s only been a little over two months and I have most everything back. I can’t wait to get up each day to check out my improvements. My right hand is completely back to normal without any numbness and the left is on its way. I have good strength in my legs now and I’m working on the balance”. Now this is quite the vehicle! Id love to be rollin down the street in one of these!! Good luck with the project! Now thats quite the vehicle! Id love to be rolling down the street in one of these!